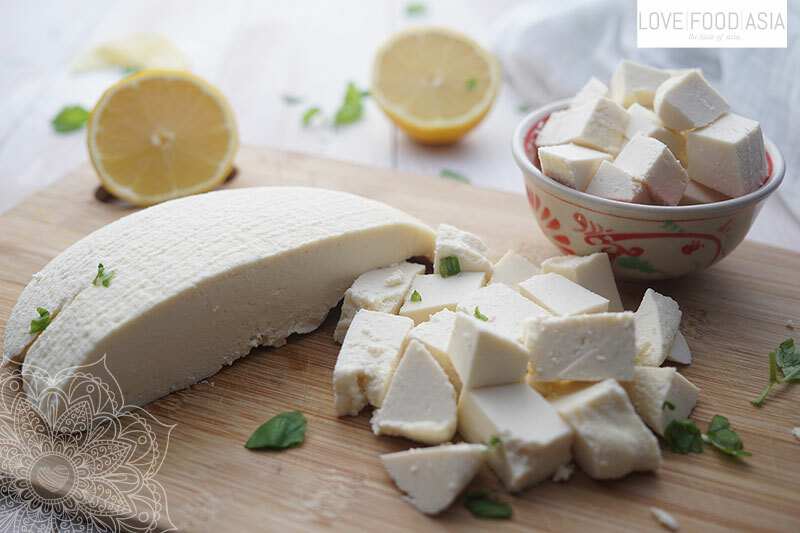 Homemade Indian Fresh Cheese (Paneer) | Love.Food.Asia. Paneer is an simple Indian fresh cheese quite similar to the well known Ricotta. It is a bit more dry and made without salt but this delicious cheese is softer than tofu. In cooked dishes it can be used like tofu. You can cook or fry it. Paneer is well known from the North Indian dish Palak Paneer (spinach curry). Making paneer at home is simple and needs only two ingredients – milk and acid (lemon juice or vinegar work well). In our simple recipe we Show you how to make your own paneer. In the beginning heat milk and condenced milk. Bring to a boil in a non stick saucepan. Stir occasionally so that the skin does not form on the surface. When milk becomes to rise add the lemon juice. Stir milk when it starts to curdle so that the curdled milk does not stick to the base of the pan. Add the curdled milk to the cheesecloth over a bowl. Now squeeze the cheesecloth to press the liquid out. In the end put the “cheesecloth ball” on a plate and place a heavy weight on top. Leave for 40 minutes until the paneer is ready. You also can use a cheese form for homemade cheese.